Before the design of steel sheet piles cofferdam must be clear that the construction workers in accordance with this order to determine the critical sequence with the minimum time to consider the cofferdam construction and demolition of the load in the process. 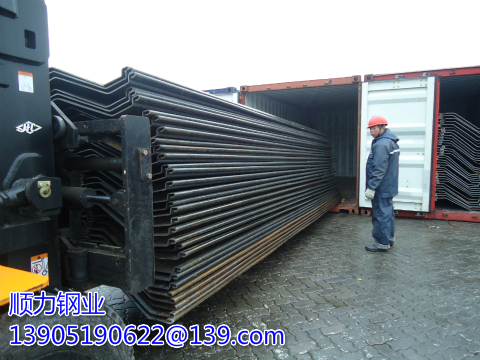 The designer can embed the depth, Bending moment and shear force into the length of the pile, and find the section and length of the pile. As part of the construction analysis, the designer should carry out a risk assessment of any deviation from the planned process. This does not include this kind of situation: the super-excavation of a certain stage; the sheet pile does not reach the required embedding Depth; the support is installed in the wrong position; the huge overload due to the construction equipment or material. The vast majority of cofferdams are temporary structures, so it is not economical to consider all possible loads in the design. The level of acceptable risk for sheet pile cofferdams may be determined based on site conditions. This may occur when considering considering cofferdam water pressure for example , Flooding is seasonal and if the cofferdam is designed to block water in any case it will significantly increase the size and strength of the sheet pile and also increase the amount of support. In extreme flood conditions, the design concept of steel sheet piles cofferdams should Including temporary suspension of weir construction, withdrawal of cofferdam and flooding of cofferdam. In such cases, the designer must consider flooding, including the effect of a sudden flooding into the cofferdam and the effect of stagnant water in the weir on the stability of the flood . Prior to commencement of construction, the construction site should be cleaned in order to erect the guide frame and the equipment in place. All equipment and materials, including pumping equipment, must be ready before excavation. Once the excavation is completed, it is necessary to monitor the cofferdam and support to ensure the normal operation of a security risk to the problem as soon as possible to alert. Monitoring records need to be made - in the UK this is a statutory requirement. Listed below are some of the factors that can cause damage to the project, from which we can see a significant part of the steel sheet piles construction after the completion of the problems related to.